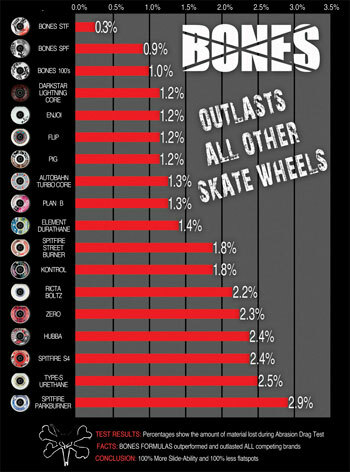 To help you better understand the difference of quality between BONES wheels and other popular brands, we have prepared an abrasion test results sheet for you. We think this visual reminder will help you to dispel the myth that all wheels are created equal. It is graphically clear, very easy to use, and showcases the differences in the durability of different wheel compounds. First we weigh each set of wheels and then attach them to a fifty pound block. We then drag the wheels on two different surfaces at a set speed and distance. After the test is done we then weigh the wheels again to determine the percentage of material loss for each brand. As you can see by the results BONES Street Tech Formula out performed all other brands by a convincing margin. All BONES WHEELS manufactured products are warranted against manufacturing defects for the useful life of the product. Check our Factory in the Good Ole USA!